iNNOV was proud to be asked to create the Cardinal Special System (SPC). Cardinal, a leading national glass manufacturer, sought a solution to their complex scheduling and efficiency concerns. They were experiencing a variety of production errors and incorrect shipment issues prior to iNNOV’s involvement. Our software engineers created a custom system that virtually eliminated these production line errors while delivering a myriad of streamlining features. Scheduling can now be automated and optimized, resulting in significant savings of time and money. Production orders, as well as reports, are now generated automatically, easing the burden of the office staff immeasurably. iNNOV intuitive software intelligently prioritizes and adjusts to special orders and situations on the fly. Logistic nightmares have become a thing of the past. The Cardinal Special System also integrates with the existing Cardinal corporate networks and Intranet (using Liquid Infrastructure), allowing for remote monitoring. Perhaps even more important, the Cardinal Special System has introduced an entirely new level of accountability within their company. Efficiency has demonstrably improved as has overall productivity. Logistic errors (i.e. human errors) have been virtually eliminated since the new system came online. One of the systems many custom features enable Cardinal to prioritize based on geographic location, customer, and deadline. This insures that the product that is going the farthest distance from the manufacturing plant is always produced before product that travels a shorter distance. It also dynamically insures that deadlines are met and automatically sorted based upon a floating matrix. The Cardinal Special System is both adaptive and auto-sensing. 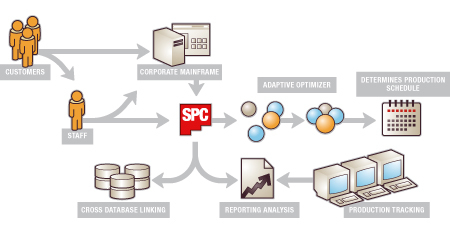 The SPC dynamically generates reports that summarize activity and capacity automating and increasing the reliability of what was previously done manually. It encodes all important business processes thus reducing the learning curve and allows integration with their custom shipping system.